Three choices for natural freshness and relaxation around your home. Peaceful Nights: a gentle blend of Lavender and Chamomile floral waters. Perfect as a linen spray to promote relaxation and sleep. Great for babies too! 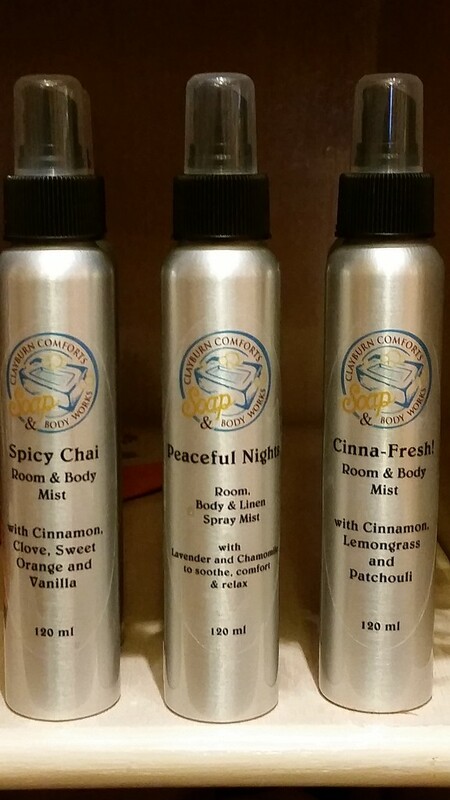 Cinna-Fresh: our top selling room spray, infused with the essential oils of Cinnamon, Lemongrass and Patchouli. A real favourite as a bathroom spray, sport bags, running shoes, etc. Spicy Chai: slightly seasonal, with a gentle reminder of Grandma's kitchen, this popular spray delights with the essential oils of Cinnamon, Clove, Sweet Orange and Vanilla. Directions: Shake well. Spray into air for light freshness. To use as a body mist, spray into the air and walk under the falling mist. Do not spray directly onto painted surfaces. May stain some fabrics. For external use only.